Not only does Brighter Green publish rigorous studies and policy papers based on research across the world, we also understand the importance of sharing our findings with the general public. Through various formats, such as videos, presentations, policy briefs, and conferences, we seek to spread awareness of important global issues of environmental preservation, sustainable development, animal welfare, and human rights. Below you will find links to various forms of information designed to engage communities with these pressing issues. Above is the trailer for What’s For Dinner?, a documentary on industrial animal agriculture in China, and one of the first films produced by Brighter Green. Find out more, see its sequel (Six Years On), and request a screening guide here. For more videos on issues from dairy farming in Asia to young women’s leadership in Africa, visit this page. 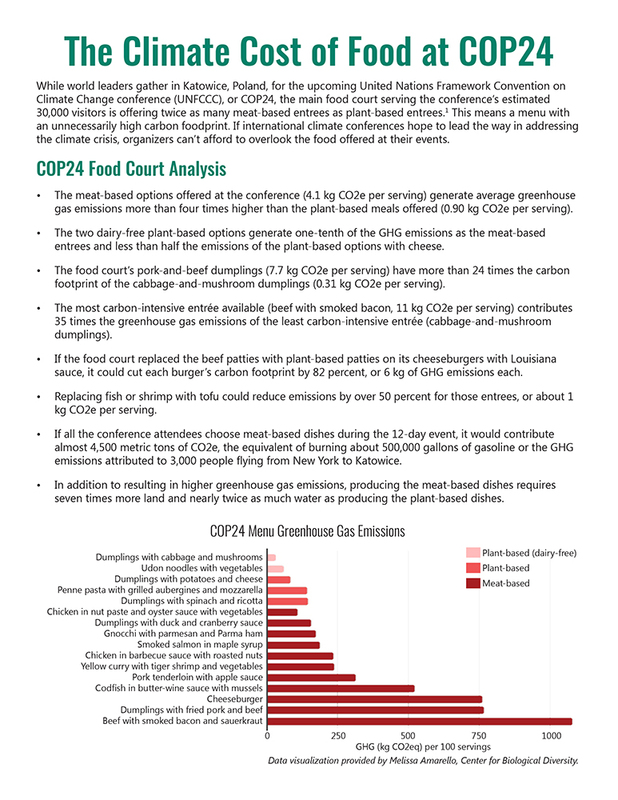 In December 2018, Brighter Green was featured in several articles about the climate cost of food at COP 24, check it out! For a more thorough look at all the articles Brighter Green has published over the years, look here . Brighter Green attends many summits on climate change, including those organized by the United Nations and Global Climate Action. We also host many exciting events and conferences. In 2018, the Good Food Fund collaborated with Brighter Green to host the Good Food Hero Summit, shown above. For upcoming events and conferences where you can find Brighter Green, see our events page. 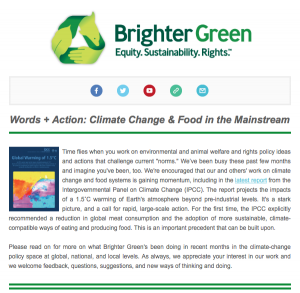 Several times per year, we send out a newsletter with the latest from Brighter Green. Sign up here! See our archives here. Brighter Green also has archives of powerpoint presentations, podcasts and radio broadcasts, and additional resources for educators or anyone who wants to find out more about the issues Brighter Green is working on.